My pal Marc is at the halfway point for his fundraising ride from San Fran to Los Angeles to help his friend recover from Lyme Disease. PLEASE DONATE NOW SO THAT HE CAN MAKE IT HOME TO L.A.! 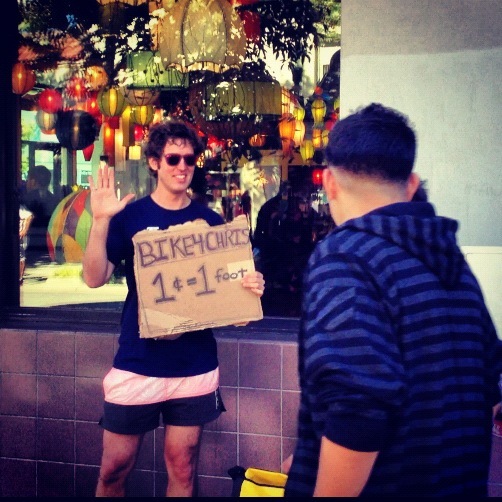 Your donations drive him forward - 1 penny = 1 foot that he will bicycle. No donations = no movement! Help him help Chris now! Hi! My name is Marc Horowitz, and on August 30th, 2012, I am going to ride my bicycle from San Francisco to my home in Los Angeles to raise money to save my friend Chris’ life.Chris is suffering from Lyme disease and needs our help. LA is 2,664,000 FEET from San Francisco. If I can raise just ONE CENT for every foot I travel, I can give Chris $26,640 towards his mounting medical bills. I can only bike as far asYOUR DONATIONS take me.. literally! If you donate $1, I’ll pedal 100 feet and then stop until the next donation rolls in. $100 moves me 1,000 feet - $1,000 takes me 100,000 feet closer to my goal. Get it? I only have 15 days to complete my trip, and I’ll be documenting the whole thing and posting updates right here on this site. You’ll be able to follow me on the map in real-time and watch your pennies push me home. Remember: Every donation counts. For every cent donated, we’re one foot closer to our goal. My ride is powered by your donations. To make things a little more fun: For donations over $50, I’ll take a scenic photo and dedicate it to you on the site. For those who donate $100 or more, Ill put your name, band name, business name.. whatever you want (as long as it’s not a curse word) on the site and list you as an official sponsor for the ride. The site and my updates will be posted on twitter, google plus, facebook, instagram and tumblr and will be seen by hundreds of thousands of people! We are open for donations right now. I’d like to get a head start by launch day so I dont get 2 miles outside of city limits and have to sit on the side of the road waiting for my next donation. All proceeds go directly to Chris’ caretaker, Catheryn Vatuone. Immediately following this project, Chris will begin his treatment at Gordon Medical under the care of Dr. Wayne Anderson. If you don’t know what lyme disease is click the link down there to learn more about this devastating and painful disease. Thanks! And I’ll see you soon.